Mikael Bergstrand is a journalist and author from Malmö, in the south of Sweden. He has previously worked for many years on Southern Sweden's leading daily paper Sydsvenska Dagbladet. In 2007 the Mikael moved to India, and lived in New Delhi for almost four years, sharing his time between traveling and writing. Since 2011 he lives in Sweden again, but still travels frequently to India. 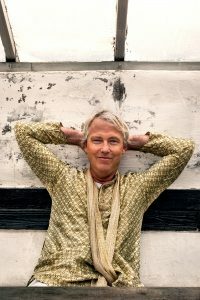 In 2011, Mikael Bergstrand got his big breakthrough with Dehli's Most Beautiful Hands, which has been sold to several countries and was made into a TV series in 2016. The books about Göran and Yogi have sold more than 200.000 copies to date.